WASHINGTON — U.S. President Donald Trump has the legal authority to keep U.S. forces in Iraq and Syria indefinitely, Pentagon and State Department officials said in a pair of letters released this week. The letters detail the Trump administration’s plan for an open-ended mission for U.S. forces, beyond the fight against the Islamic State group. The letters — first reported by The New York Times — were to Virginia Democrat Sen. Tim Kaine, an advocate for a replacement for the post-9/11 war authorizations for the use of military force. The letters come amid various efforts from congressional Republicans and Democrats to have Congress approve a new authorization, or AUMF. Kaine and other critics argue the White House’s use of authorizations from a decade and half ago is a legal stretch. He called on Trump to seek a new authorization. “We anticipate these numbers will decrease as the nature of our operations change in Iraq and Syria, but we do not have a timeline-based approach to our presence in either Iraq or Syria,” Deputy Under Secretary of Defense for Policy David Trachtenberg wrote in the department’s letter to Kaine. Administration officials emphasized the continued potential threat from ISIS as justification for U.S. troops to remain indefinitely deployed. In its letter, DoD included a list of complex precursors to the department considering ISIS defeated: stabilization, political reconciliation and local security forces becoming self-sufficient. “Just as when we previously removed U.S. forces prematurely, the [Islamic State] group will look to exploit any abatement in pressure to regenerate capabilities and reestablish local control of territory,” Trachtenberg wrote. For now, the DoD is not targeting other militias or organizations, including Shia militia groups or Iranian proxies, the officials said. U.S. Secretary of State Rex Tillerson said Monday night that American forces will stay in Iraq in order to defeat the Islamic State group, even if the government in Baghdad requests the U.S. leave. 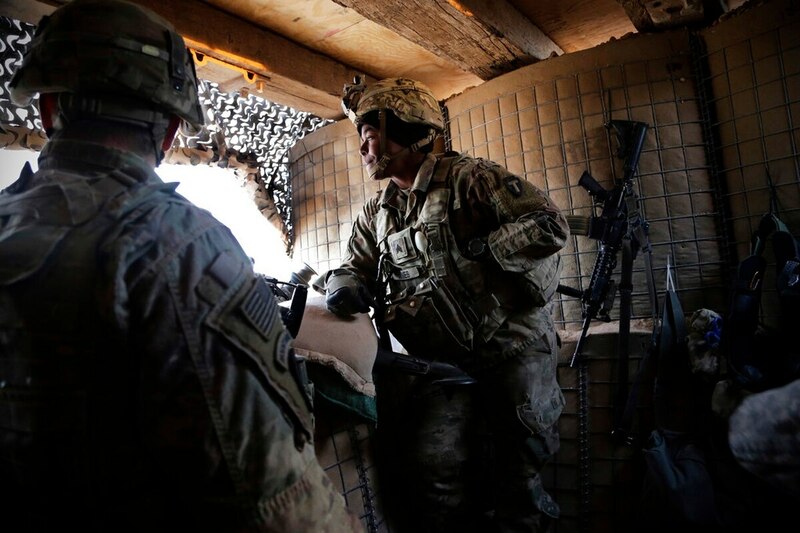 The 2001 war authorization, or AUMF, lets U.S. troops use force to defend themselves and defend counter-ISIS partner forces, the officials said. It also covers some “limited and lawful” U.S. strikes against Syrian government forces — though they are not considered ISIS partners under the 2001 AUMF, Trachtenberg wrote. The administration, Kaine said, has not shared its full legal justification for striking a Syrian air base in April. With Trump invoking a constitutional authority in the attack to justify “unilateral military action absent an imminent threat to the United States or its personnel, it is clear the Trump administration is crossing a Constitutional line,” he said.